LAHORE, (SANA): Punjab Finance Minister Mian Mujtaba Shujaur Rehman has presented the budgetary proposals for fiscal year 2013-14 with an outlay of Rs 890 billion. Punjab government has announced to allocate Rs 3 billion for Ashiana scheme. He announced to start metro bus projects in three cities including Faisalabad, Rawalpindi and Multan. He announced to fix minimum wages of labourer at Rs. 10,000. He announced to increase pension and salaries of government employees by 10%. The increase would be applicable from July 01. Laptop and solar schemes for students would continue in next year. He said luxury tax would be imposed on the houses of two canal or bigger then two canals. The Punjab assembly session was held under the chairmanship of Speaker Rana Muhammad Iqbal Khan and also attended by Punjab Chief Minister Mian Shahbaz Sharif and all cabinet members. The restriction of recruitments in all departments excluding judiciary would continue, adding that the ban on purchase of vehicles for government functionaries would continue. The Punjab government has announced 30% decrease in the expenditure of the chief minister house. He said that the targets will be set for all fields. He said parwari system would be changed in Punjab during the year 2014. He said that the police system would be changed with the help of Turkey and UAE. He said that to improve the good governance all regulations and laws have been made online. He said that government has allocated Rs 28 billion for provision of cheap flour for masses. He said that the new projects of energy would be started from the waste of sugarcane. He said that Rs 20.43 billion rupees are being allocated on the new projects of energy. He said that the government will work on war footing to deal with the energy crisis. He announced to allocate 7.5 billion rupees for the Punjab Education Foundation for the next fiscal year. He announced to allocate Rs 1.5 billion for the computer labs of the province. He announced Rs 1.5 billion for establishment of 100 computer labs in whole province. He also announced Rs 3 billion for the establishment of Danish Schools. 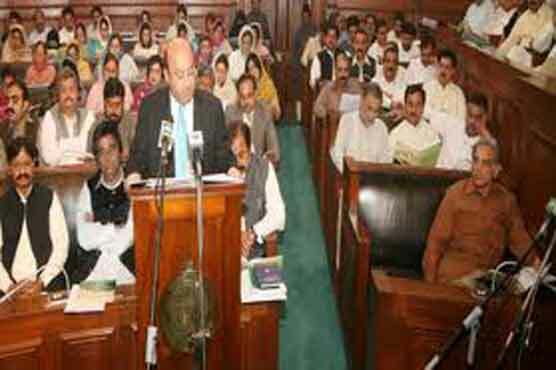 He announced to allocate 6.67 billion rupees for the higher education in Punjab. He announced to allocate funds for establishment of universities in Bahawalpur, Faisalabad, Multan and Sialkot. He said that there is proposal of establishment of international level IT University in Sialkot. He announced to allocate Rs one billion for the Ujala program for students. He said that health insurance card would be introduced for provision of health facilities to poor people. He announced Rs 10.87 billion for setting up of filtration plants in rural areas of the province. He said four new medical colleges would be established in the province. He announced to allocate Rs 29.22 billion for construction of roads in the province. He announced to allocate Rs 93 billion for the development projects of South Punjab. He said the grievances of the South Punjab people regarding development would be rooted out in one year. He announced Rs 2.5 billion for provision of facilities in South Punjab schools. He announced to allocate Rs 4 billion for distribution of lap tops in youth. He said that the poverty alleviation programs for South Punjab would continue in future also. He announced to start metro bus projects in three cities including Faisalabad, Rawalpindi and Multan. He announced to allocate Rs 7.5 billion for provision of facilities to farmers of Punjab. He announced to allocate Rs. 5.5 billion for the progress of agriculture sector of province. He said interest free loans would be given to 68,000 youth in Punjab, adding that Rs 3 billion has been allocated for this purpose. He announced to create 1000 new posts in lower judiciary of the province. He announced to fix minimum wage of labourer at Rs. 10,000. He said the government would give scholarships to 12,000 children of labourers. He announced to allocate Rs 1.44 billion for the progress of live stock and diary development. Mujtaba Shujaaur Rehman said no new tax would be imposed on the common man, adding that the rich people would be brought in the tax net. He said that the tax would be taken from rich and would be spent on poor farmers. He said luxury tax would be imposed on the houses of two canal or bigger then two canals. He said that the Punjab government has presented Rs 290 billion in form of development budget. He said that all the steps taken during the budget by the Punjab government according to the vision of the PML-N leadership. He said that the people of the country have given votes to PML-N due to its performance in Punjab. Meanwhile in the start of the Punjab Assembly session a unanimous resolution condemning the terrorist attacks in Quetta and Ziarat was adopted.